Welcome to the Data Information page. Here you can find information about the FLUXNET Dataset, such as data availability, data policy, variable explanation, data processing, and most importantly, where to download data. Briefly, at each tower site, the eddy covariance method is applied to quantify the fluxes of scalars (e.g., CO2, CH4, water vapor) and energy (e.g., sensible, latent heat) between the biosphere and atmosphere. In addition, continuous measurements of ancillary physical variables (e.g., air temperature, precipitation, radiation) are acquired from a large number of sensors at high temporal resolution. The half-hourly or hourly fluxes are calculated and quality-controlled by the local tower teams. The data is then transferred to the Regional Networks and the FLUXNET Data Portal — Fluxdata. In this process, the Regional Network and Fluxdata teams standardize the data format, perform uniform data quality checks, and produce value-added products using highly vetted gap-filling and flux partitioning software developed by the European team and the AmeriFlux team (see data processing). The processed and standardized dataset is then archived and prepared for querying, distributing, and downloading. Over the past 20 years, there have been several data synthesis activities initiated by the FLUXNET research community (History of Fluxnet). 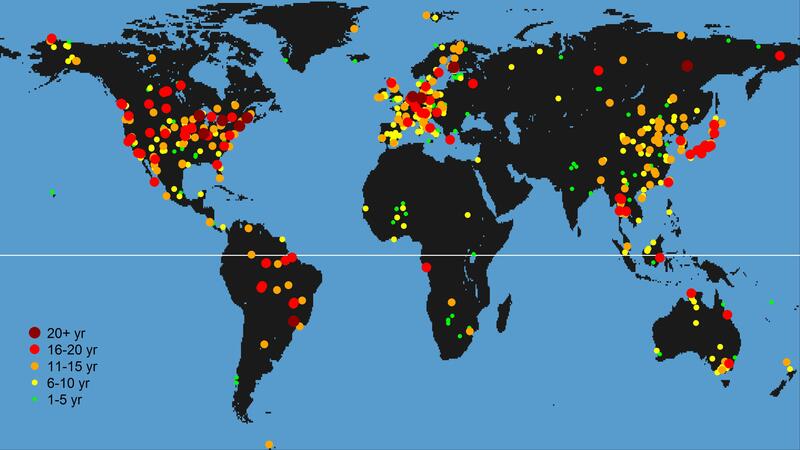 The most recent dataset produced is the FLUXNET2015 Dataset, which includes over 1,500 site-years of data from 212 sites. The previous dataset was produced in 2007 (La Thuile Dataset), containing over 960 site-years of data from 252 sites. To be involved in upcoming releases please contact your regional network coordination office.